Featuring a minimalist design with classic and contemporary styling, the Berkeley 48-inch Bathroom Vanity lends an air of sophistication and charm to any bathroom decor. Made of solid birch hardwood and engineered to prevent warping, this vanity is sure to provide long-lasting style in your bathroom. A traditional white finish with marble vanity top and 3-inch backsplash blends with most settings, for a subtle, chic look. Metal exterior hardware with a brushed chrome finish offers a beautiful overall accent with a polished shine. Berkeley 48-inch Vanity in White with Marble Vanity Top in Carrara White and Oval Basin Featuring a minimalist design with classic and contemporary styling, the Berkeley 48-inch Bathroom Vanity lends an air of sophistication and charm to any bathroom decor. Made of solid birch hardwood and engineered to prevent warping, this vanity is sure to provide long-lasting style in your bathroom. A traditional white finish with marble vanity top and 3-inch backsplash blends with most settings, for a subtle, chic look. Metal exterior hardware with a brushed chrome finish offers a beautiful overall accent with a polished shine. 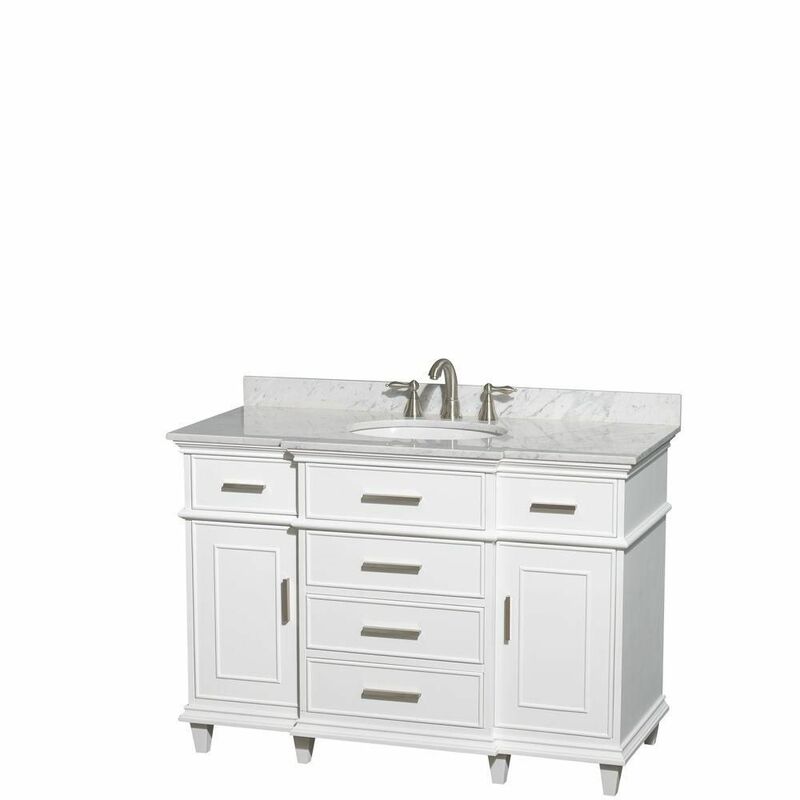 Berkeley 48-inch Vanity in White with Marble Vanity Top in Carrara White and Oval Basin is rated 4.6 out of 5 by 11. Rated 5 out of 5 by MelW from I purchased this for a bedroom becoming a bathroom. It was recently installed. Excellent qualit... I purchased this for a bedroom becoming a bathroom. It was recently installed. Excellent quality...solid wood, soft close hinges, fully assembled. Beautiful warm dark brown color. Exceeded my expectations. Perfect! yes pre drilled --- i believe it requires an 8 inch spread if i remember correctly. Our vanity is pre-assembly, you only need to switch handles from interior of drawer to exterior front. Attach the counter top per instructions.